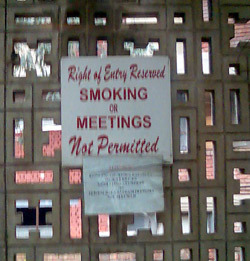 I know, I know, the guy stenciling it on is probably illiterate, but the lettering is still funny. 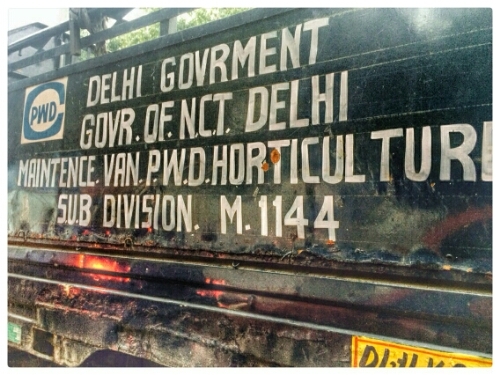 Thanks for the entertainment Delhi ‘govrment’! Test full. C’mon. 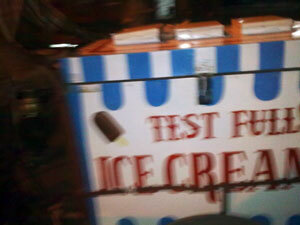 It’s test-full icecream. Just like the kulfi you get in Chowpatty which is “with the full of nuts and fruit”. 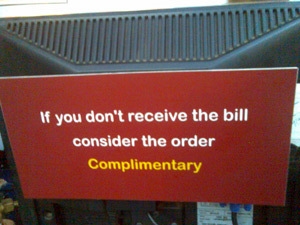 Once in a while, I come across a sign that just baffles me. I think we should run a little contest here for an alternate caption and/or a subtitle to farther edify the folks who wonder she has what?? 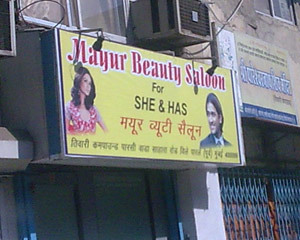 Did they really mean “she and his“? But that still doesn’t make any sense. 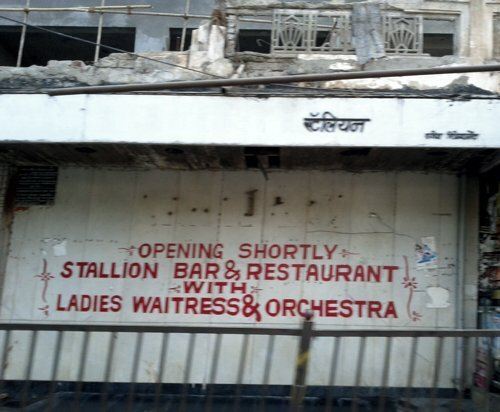 This one’s in Goregaon. 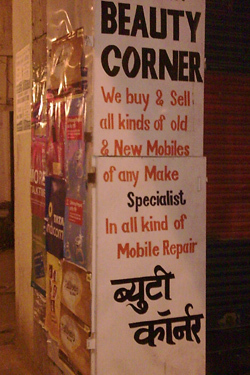 The other one in Lower Parel I like is a mobile watch repair shop & hair saloon (sorry, sailoon) in one. I suppose whether your phone is broken or you need a trim, you can use your time efficiently getting a twofer instead of loitering. This beauty caught my eye in Colaba. At first glance, of course, I figured it was cosmetics, hair clips, the usual fare. But someone out there is more confused than I am 🙂 Signs like these aren’t rare. But since I have really nothing more to add … I’ll let the picture tell the rest of the story. 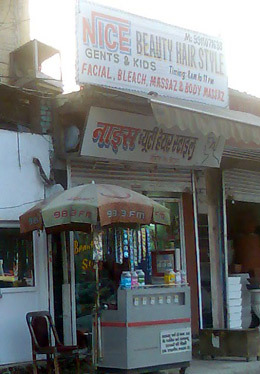 This is a Delhi photo – of course! 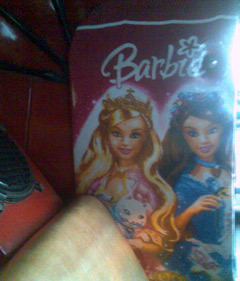 I was nearly home when I looked to my left and to my right and found myself eye-to-eye with not one, but two Barbies. 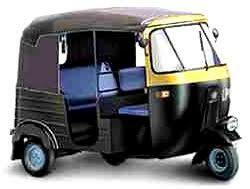 Most rickshaws have posters up of Bollywood stars. This was a first for me. In Mumbai though, last Thursday I was in a cab that the driver (also the owner) had furnished with a plush red and black, umm, carpet. It was on the seats, the ceiling, the flooring, and the dashboard. Then I noticed it was even on the inside panels of the doors. On further inspection and inquiry, I found out it really was the same furry fabric, only he’d had it laminated! How ingenious, no? 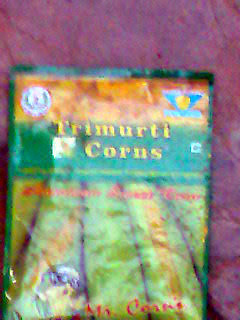 Tiny kiosks selling “American Corns” have become both cottage industry and franchise opp nearly everywhere in metropolitan India. I see them in every market and every mall and movie theatre. The other day, near a stall that sell the steamed “corns” (in masala – yum, Chinese – too salty, Italian – too much oregano, and American – absolutely bland flavors) I found the discarded packaging of the frozen kernels. It gives me the absolute heebie-jeebies every time I see it written down as corns (plural). 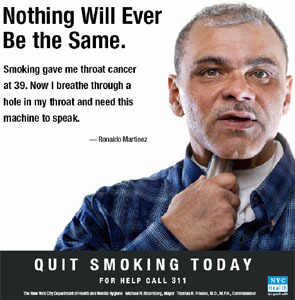 I always, always get a mental visual that grosses me out. In fact, a simple google search will show you exactly what I mean.